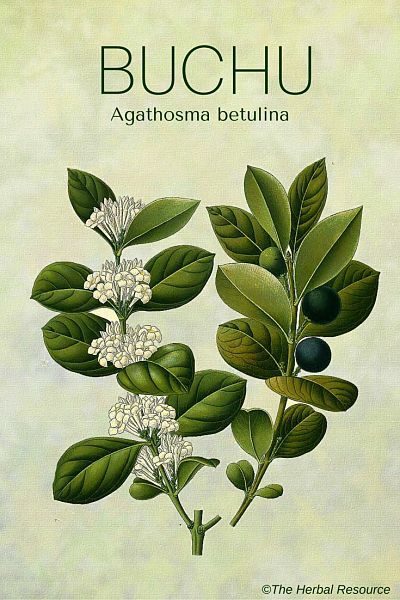 Botanical Name: Agathosma betulina, Barosma betulina. Other Common Names: Buku, bucco, round buchu, bookoo, bucku. Habitat: Commonly found in wet low elevations in the western portion of South Africa. The plant has been introduced into private gardens and nurseries but is not known to be native in any other part of the world. Plant Description: Buchu is a shrub that grows to nearly two meters tall, and has a red-brown to violet-brown bark. The leaves have jagged appearing edges, range in color from yellow-green to brown, and are covered in oil glands that give them an oily, wet appearance. 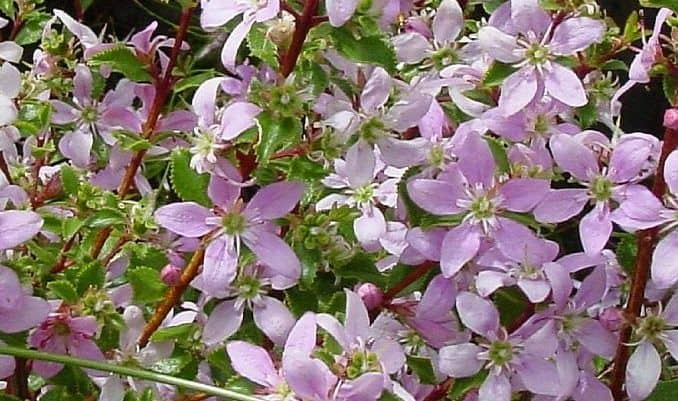 The flowers are white or pale pink, are quite small, and have a distinctive star shape. Plant Parts Used: Leaves, specifically the oils they produce. Medicinally, buchu has a very long and well-defined history. It has been used for many ailments outside of its prescribed treatments, but there is little or no verification of those added benefits. It is well suited for use with children and for the elderly, owing primarily to its mild effects. It was used in the treatment of urinary problems in Africa before Europeans arrived there. The use of buchu can be documented as a treatment for kidney and bladder problems for more than three centuries, and evidence suggests it may have been used as an herbal medicine for thousands of years. Dutch Afrikaners adopted it for the treatment of kidney stones, arthritis, cholera and muscle aches as well as urinary tract infections (UTI). There were claims that it had mild pain relieving properties as well, but these have not been verified in laboratory tests. The Khoikhoi or Khoi, native people of southwestern Africa, developed an alcoholic beverage known as buchu brandy, which is still manufactured and distributed. This brandy was used medicinally by physicians for generations but has now been discontinued. It is still widely used in home remedies. Buchu is a common ingredient in many well-known pre menstrual prescription medications. In the United States, the plant itself is not recognized as a medicinal herb, but the oils extracted from it are used in commercial medications. Buchu was first introduced as a patent medicine in New York 135 years ago, and while it no longer sold in the US, it is widely available in Europe. This plant reportedly acts as a mild diuretic, and clinical tests have demonstrated that these properties are quite gentle, making it effective for minor treatments, but requiring heavier dosages for more severe applications. Buchu is also being investigated for the treatment of high blood pressure and congenital heart failure. The research today proves to be promising, but no definite scientific statistics are as yet available. Among many local African cultures, an infusion of the leaves has been used as an herbal treatment for premenstrual syndrome (PMS). It has been adopted for the same use in many other countries as well and is widely available in holistic and alternative health shops. A tea may be prepared by infusing the buchu leaves in hot liquids. Similarly, the crushed leaves may be added to thin soups and broth, and then strained out before serving. Do not boil the leaves. There are few, if any, side effects related to the use of buchu itself. Ingesting large amounts could conceivably result in diarrhea, but this is not substantiated. This herb is not recommended during pregnancy because there seems to be a small possibility it might provoke an abortion. In addition, it may cause stomach and kidney irritation. The plant is a diuretic and therefore may deplete the store of potassium in the body. When using buchu for medicinal purposes, it is advisable to supplement the diet with a food high in potassium, such as bananas. Blumenthal, Mark: The Complete German Commission E Monographs. Austin, Texas. American Botanical Council 1998. Chevallier, Andrew: Phytoterapy. Fifty Vital Herbs. London, Amberwood Publishing Ltd. 1998. Fetrow, Charles W. & Juan R. Avila: Professional’s Handbook of Complementary & Alternative Medicine. Springhouse, Pennsylvania. Springhouse Corporation 1999.